Hatters boss Nathan Jones hasn’t got a points target in mind this season to make sure his team win automatic promotion. Over the last five years in, 82 points has been the average to finish inside the top three and reach League One, although Bristol Rovers needed 85 to achieve the final place last season. We know what we have in the building, now it’s about having a run so we don’t look back and have any regrets. 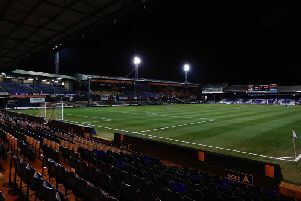 With 17 games to go, Luton are on 46 points, six behind Carlisle United, meaning they need to put a winning run together, and soon, to achieve Jones’ aim of going up. On whether he has set a points tally for his side, the Town chief said: “No, I don’t. Normally it’s a certain thing, but it might be less, it might be more, with the form of a lot of team. “What we have to do is concentrating on putting runs together now. We’ve been pretty consistent, but we’ve just dipped at times and drawn more games then we should have. Standing in Town’s way of starting a winning sequence today, are a Crawley side who have struggled on their travels this term in what is Dermot Drummy’s first full campaign in charge. Jones continued: “I think they’ve got a bit of a different identity now (under Drummy) and have gone down a different route with certain players. Hatters were beaten 1-0 at home by Crawley last seaosn, with Matt Harrold’s early strike settling a match that Town completely bossed from start to finish. Jones intends to make sure that doesn’t happen again this time though, as he said: “That was symptomatic of what we did. We had 75 per cent of possession, had 22 shots on target, must have been 30 crosses into the box, and they had one opportunity the whole game and we lost 1-0. “Now that’s happened. It was symptomatic of the Cheltenham game (lost 3-2) the other day, not quite the stats, but not far off. “So we can’t have that level of dominance without winning the game. Meanwhile, Jones knows that Red Devils’ top scorer James Collins is a major threat for the visitors having bagged 16 goals this term, as he added: “He’s a threat, he scored against us down there. We know James Collins, we’re aware of him, we know he’s a good experienced striker at this level.